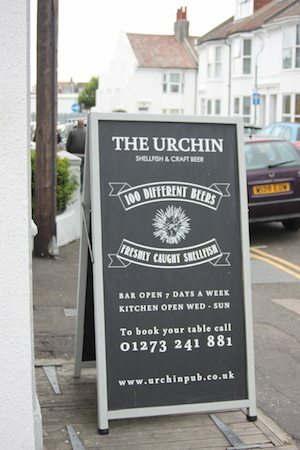 We are seeing lots of Craft Beer pubs popping up around the city; The Urchin offers us something more. Filled to the brim with Craft Beer from around the world, here you can enjoy your bottle with a pint of prawns. Serving only shellfish on the menu – the favourite cuisine of manager and co-owner Nick Jerrim – The Urchin has found itself a niche. Not long open, this slightly unusual pairing of food and drink, seems to already be making its mark. 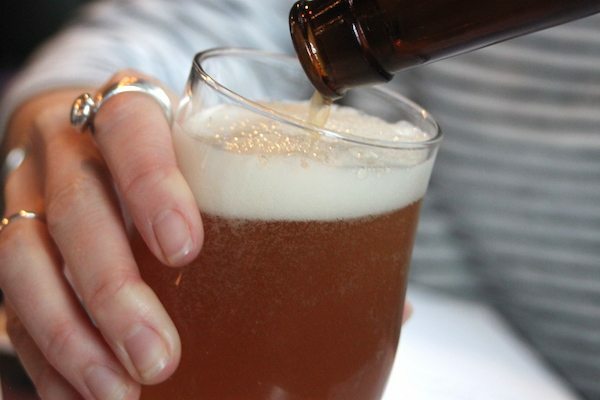 A seafood lover myself, I’m eager to discover what I have been missing out on – is beer really the best thing to drink with my Moules Marineres? 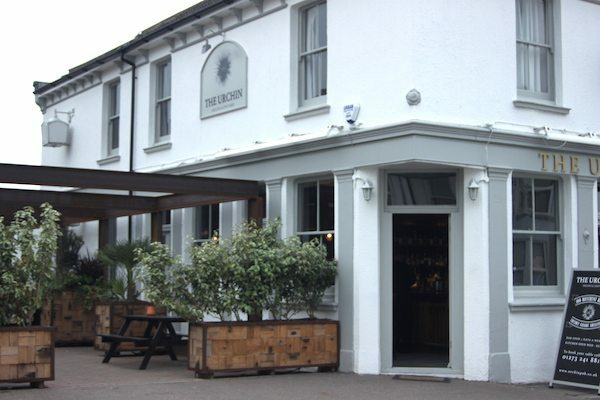 On approach, The Urchin appears modern but retains a bustling pub vibe. It has a nice beer garden draped in greenery around the side, where some punters are enjoying themselves an alfresco bottle of something from the vast selection. Inside the pub is busy and the hum of the diners hangs in the air. There are a few stools around the bar, but it is clear that most of the people in here tonight are here to sample the grub. The drinks menu boasts over 100 different Craft beers; The food menu is displayed on two modest sized chalk boards on either side of the restaurant. The décor is simple, fresh, and mainly wood. 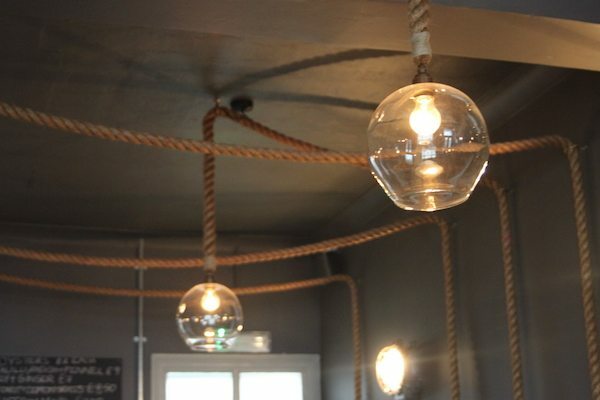 The lighting hangs from the ceiling on thick pieces of rope, nodding to the seaside and notably the most interesting feature. The Urchin has gone for clean aesthetics; letting the food and drink speak for itself. We have booked our table for 8pm, and there is not a spare seat in the house. Unfortunately for us, that does mean some of today’s most popular dishes are off. We have already clocked the blackboard which has been updated throughout the day; little chalk lines making our decision making a little easier. The good news here: there’s no doubt that the shellfish is fresh. However, my recommendation: book your table a bit earlier to avoid any disappointment – especially if you’ve got your heart set on mussels! The beer menu is slightly overwhelming, but as always we are happy to take recommendations. 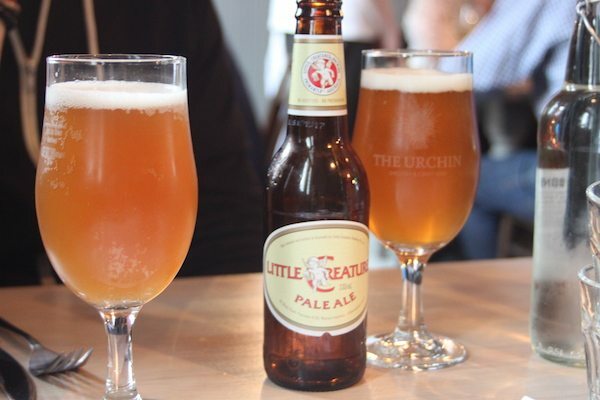 Nick personally recommends a bottle of ‘Little Creatures’ – a pale ale brewed in Western Australia, and a bottle by ‘Brew By Numbers’ – an IPA crafted in London, describing itself as a low ABV beer with a hopkick! Both sound good to me and I’m interested to taste the difference in them. Not really knowing anything about Craft beer, or beer for that matter, tonight will be a bit of an education. 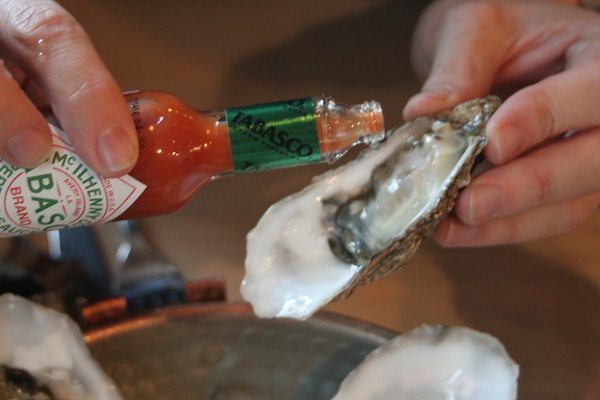 We also decide to order four oysters and some tobasco to perk them up a bit – a mini starter to consume, while we choose our actual ones. 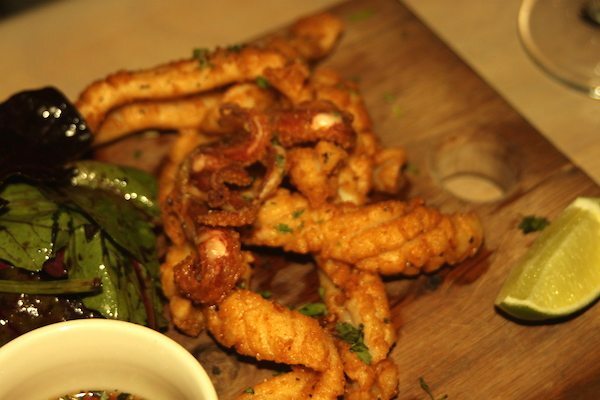 My partner has already had a sneaky peak at the menu, on the walk over he tells me he wants the soft shell crab. Luckily for him this is available, so now we’ll get to cross this off our list – neither of us have had it before. As the Razor clams – with chilli, coconut and lemongrass – is unfortunately unavailable, I go for the salt and pepper squid, which is also fine by me! Our waiter is thoughtful in advising us that both starters are deep fried, but as we are eying up a Prawn dish for our main – and the pint of prawns is our other starter option – we thank him, but stay where we are. As mussels are off the cards, again we ask for a recommendation from Nick. He is confident in his response: we should go for the Malaysian style king prawns and the Scallops with samphire and sage gremolata. At this point we order two more craft beers, again on recommendation. We’d like to try everything on the menu, but for now we are going to experience a ‘Bear Hug’ – a Brewing hybrid wheat beer/IPA – and get to do our bit for the rain forest (we read on the back of the bottles that each bottle of Bear Hug purchased saves one square foot of rain forest). We also order something fruity – a peach IPA from the Siren Brewery. Both were distinctly different from our first and should hopefully partner our impending starters very well. The starters arrive. 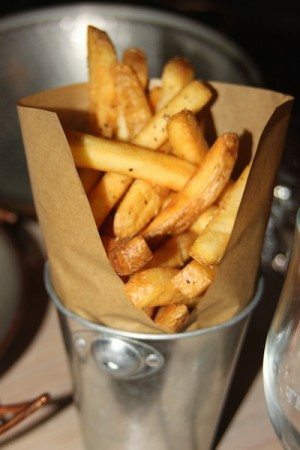 They could be easily be enjoyed as bar snacks or as starters and suit the relaxed bottle drinking vibe. The soft shell crab looks appealing with a crispy fried coating and vivid yellow house made piccalilli to accompany it, along with a crunchy radish and fennel salad. Never having had soft shell crab before, I wonder how easy it will be to eat, but it is certainly easier than a whole crab. I can see the appeal. The crab flavour is not overwhelmed by the deep frying and the distinct seafood taste holds its own. The sweet piccalilli really complements the dish and the fennel adds an interesting twist. The salt and pepper squid comes with a soya sauce and ginger dipping sauce, which for me makes the overall taste a little salty, so I choose to eat them solo. They are tender and more-ish and satisfyingly washed down with my bottle of Bear Hug. 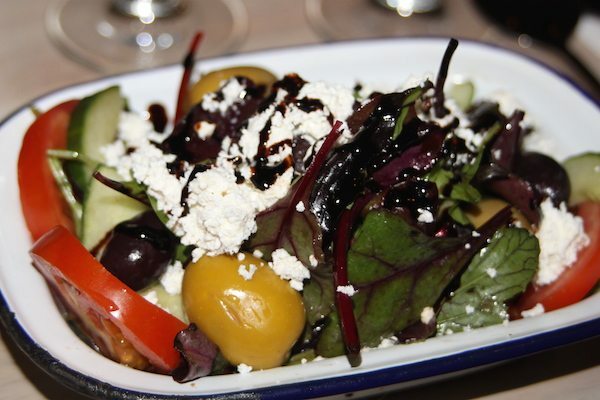 The mains and our sides of chips and a colourful Greek salad follow soon after our starters. Visually these dishes are more interesting than the starters. Both dishes are delivered in big copper coloured serving bowls, again nodding to the nautical theme The Urchin seems to be going for. 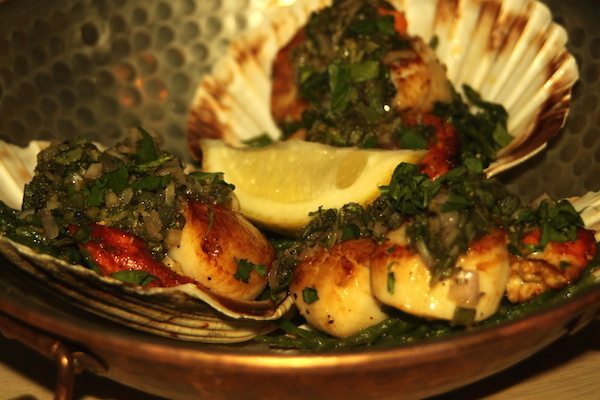 The presentation of the scallop dish is particularly pleasing; the scallops are arranged inside their shells, peppered with the samphire and a drizzle of the sage gremolata. The contrast of colours and textures here make this an enjoyable dish. The scallops have been left as they are and have not had the roe removed, which is unusual to find, but I like the fact that nothing has been wasted and to me this part tastes just as good. The samphire is a great addition to this dish and all in all there isn’t much to dislike. 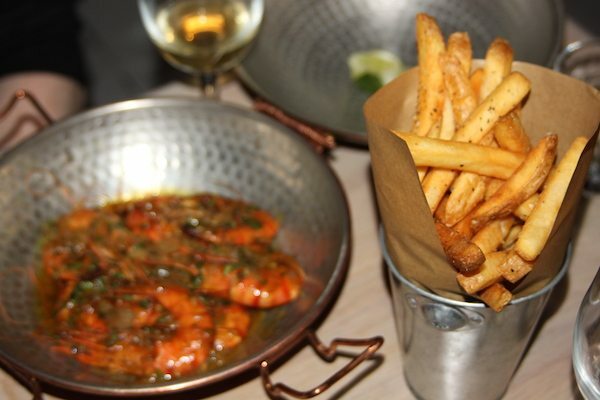 The prawns for us, however, take the gold. The sauce they are prepared and served in is rich and full of those strong Asian flavours we both love. 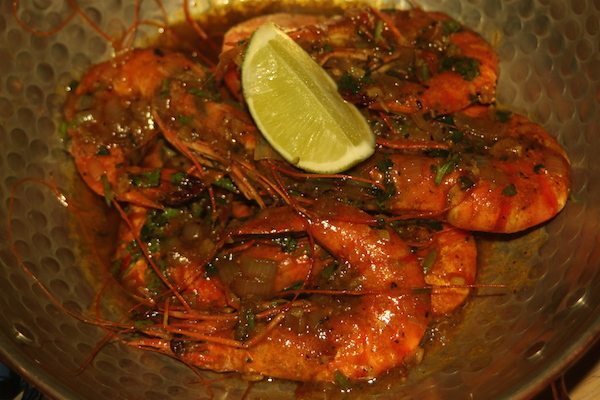 The portion is generous and the prawns are big and juicy, helped by the fact they have been cooked in their shells. It is impossible to eat these guys gracefully – thank goodness for our finger bowls! Some bread to dip in that sauce would have been a great way to polish of this dish, but in its absence our chips do the job pretty well. In hindsight we agree one side would have been enough. The chips to mop up that tasty sauce are the obvious accompaniment and ensure we are both nice and full at the end of the meal. Although we may not have needed it, the Greek salad has all the crucial elements and works very well to get some greens inside us. We swig the last of our Craft beers; acknowledge that we have indeed been impressed by the distinctly different flavours of each bottle and their paring with the shellfish. As there are so many to try, another visit in probably in order. As I did not get my mussels either – and they are clearly a best seller – we agree this is another good reason to return. 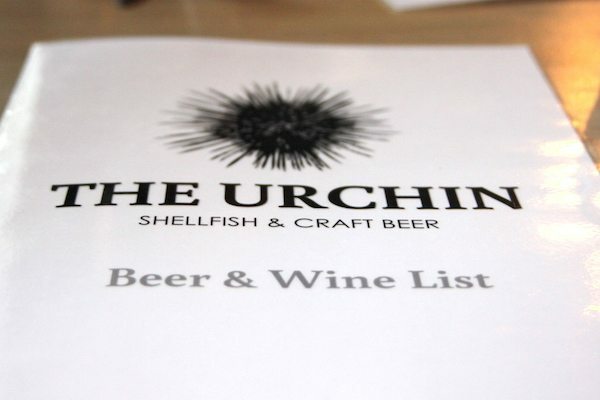 I have also liked the relaxed pub dining atmosphere in The Urchin this evening; it certainly wants to remain a pub, but with a touch of class. And what better way to achieve this than to serve exclusively shellfish – a food that will always be associated with fine dining. In fusing these two fashionable elements, what The Urchin has also managed to do, is create something new, more interesting and unique!